Hiya guys! How's it going? I am exhausted from a weekend-long shop-a-thon. Not as fun as it sounds. Online shopping only for the reminder of the holiday season. That's alright though cause that's where all my indies at! Yes, the holiday spirit is in full swing and new releases keep a'coming. 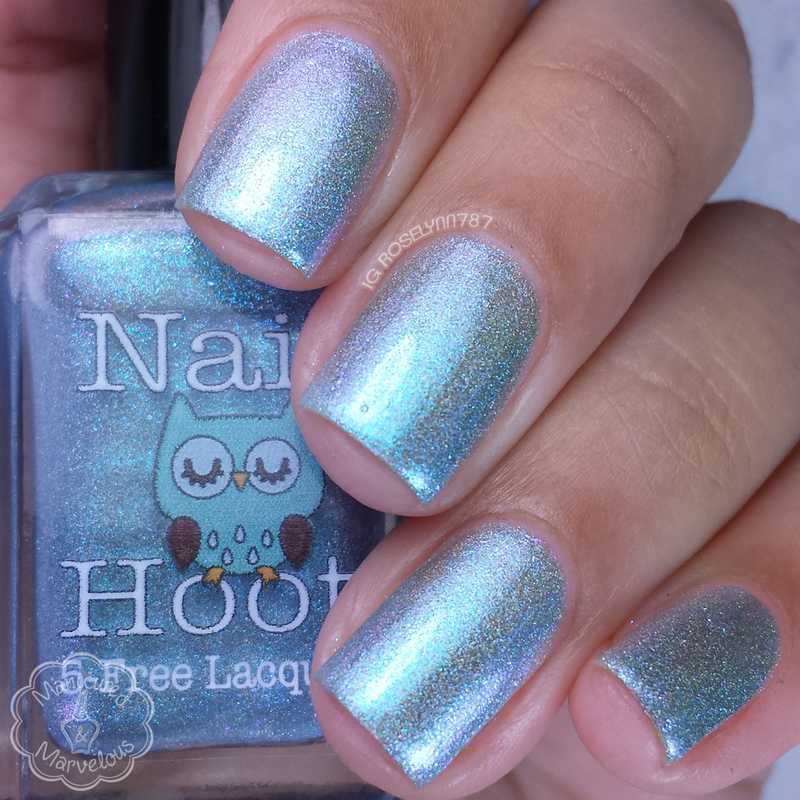 For today I am sharing swatches for the newly released holo-ful Bible Stories Collection by Nail Hoot. Note, you can read all about the inspiration for each one of the shades on the website listing. Now let's get to the swatches! The Bible Stories Collection by Nail Hoot is available now for purchase. Each full-size bottle retails for $9.00 each and the entire collection is available for $34.20. Please note that these polishes are currently in limited supply, due to issues with their supplier. There is a strong possibility that this collection will be discontinued after supplies run out. Betrayed by a Kiss can be described as a dusty pink linear holo polish. The shade is a very feminine and pretty color. 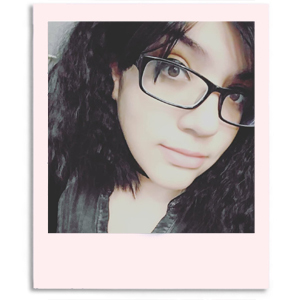 I actually don't think I have anything like it because I tend not to wear pinks too often. The formula did have a very smooth application and opaque layer. Great consistency as well. Shown here is two coats sealed with a glossy topcoat. Jonah and the Big Fish can be described as a beautiful light blue linear holo polish has flashes of pink delicate shimmer. I wish I could totally rave about this shade because it is truly a unique combination. 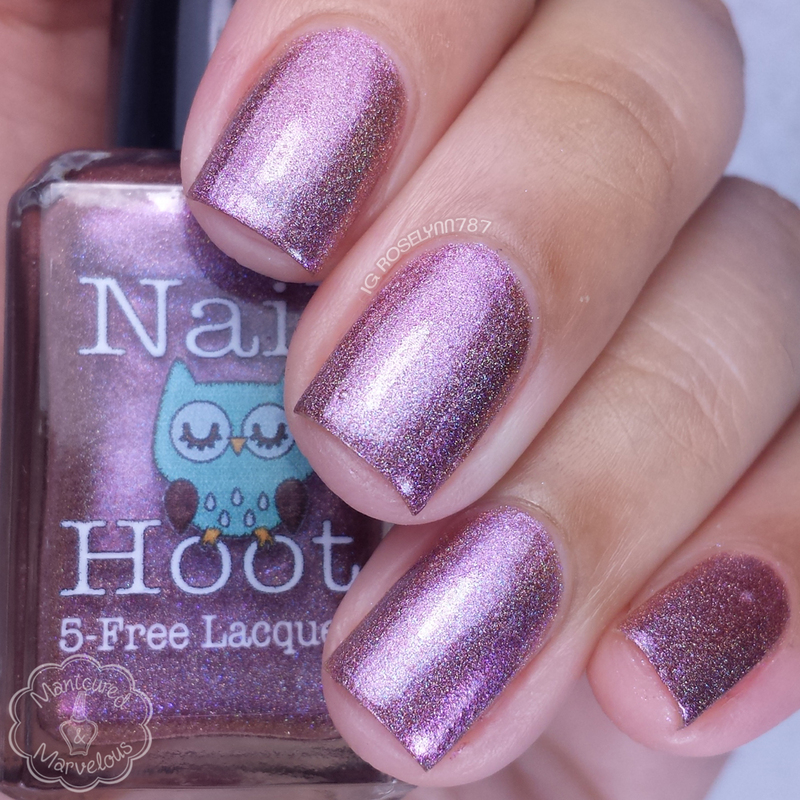 There is so much going on with the shimmer and holo, it's drool-worthy. The formula was on the thin side causing this to apply very sheer and patchy. It takes a few layers to build-up and you have to be mindful on the brush strokes. I feel like perhaps this would look and apply better over an undie so I'll have to try it again sometime. Shown here is three coats sealed with a glossy topcoat. 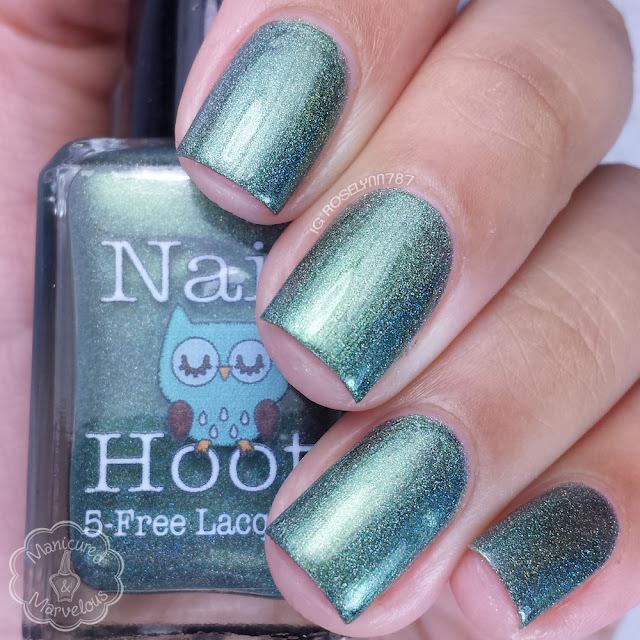 The Olive Branch can be described as a deep green linear holo. Get ready to be surprised, but this shade ended up being my favorite! I definitely think it's a must-have with its versatile tone. Formula and consistency were pretty good, not too thin or too thick. It had a beautiful smooth application with a great opaque finish. I also found the holo finish to be the strongest in this one. Shown here is two coats sealed with a glossy topcoat. 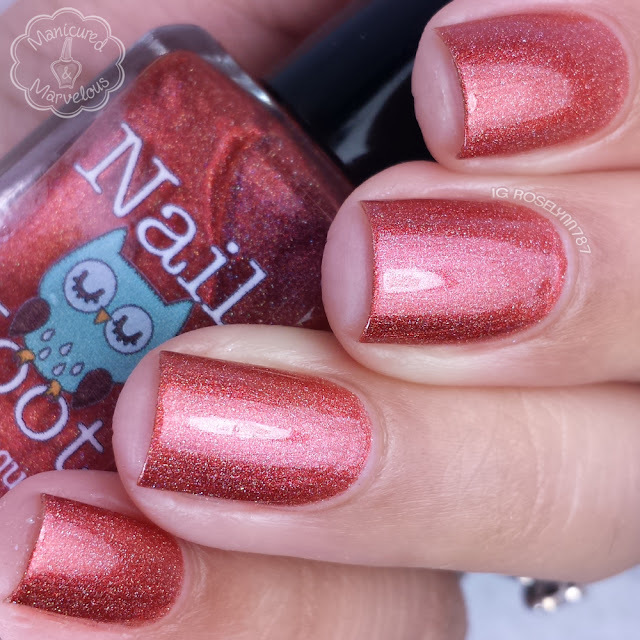 Parting of the Red Sea can be described as a red linear holo with a hint of a metallic sheen. The tone tended to lean a little more on the orange shade than red against my complexion. It's still a gorgeous shade and again a favorite from this collection. Very similar application to The Olive Branch. The formula felt very well balanced and easy to work with. It dried to a very strong holo shine finish on its own. Shown here is two coats sealed with a glossy topcoat. Overall I think this four-some kind of took me by surprise for the most part. I didn't think I was going to love the shades as much as I ended up doing. Each one of them felt like they had a little extra nudge to make them unique, like the metallic sheen in Parting of the Red Sea. Mind you these have all been taken with indoor lighting, so it is not a true reflection of how strong the holo effect ends up being in direct sunlight. If you're a holo fan I think you will really get a kick out of these. Tell me guys, which one is your favorite? Jonah and the Big Fish is seriously splendid! Definitely agree, it's so eye-catching! Such lovely and bold shades! Right?! Initially I didn't think such subtle shades would have such a huge impact. Jonah and the big fish is really something special! They are stunning, especially Jonah! I love how rich and luxurious these colors look without being dark and heavy. Jonah and the Big Fish is my favorite of the group! It's beautiful! That one seems to be every ones favorite, it has so much dimension to it! Parting The Red Sea is my favorite!! This is a great collection! I like how well they go together.